Looking for a peony with a strong personality? Mrs Franklin D Roosevelt's name is presidential for a good reason. This peony is simply a feminine sight. Mrs Franklin D Roosevelt is a gorgeous pastel peony. This American beauty is available only a short period per year. When the proud buds open up, they spread a lovely smell: almost like a perfume. Mrs Franklin D Roosevelt got registered by American breeder Franklin in 1932. Because of her nature, she was awarded a gold medal by the American Peony Society in 1948. Despite her trophy room, Mrs Franklin D Roosevelt is limited available. We receive this peony mostly from growers in New Zealand. 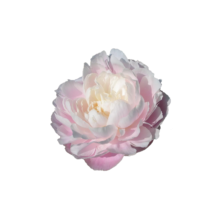 The flower is an exclusive peony that we don’t have in stock very often. Keep track of this peony: she will be gone in the blink of an eye!